I'm having a wonderful Christmas, and I hope you are too. Love to you all and all of your families. I am having a great time at Edmonton! Hope you ate lots of turkey for me! I ate masses of turkey in your honour, Jas. All my best to Joseph and Smitha. I love that song. Just adored Kirsty MacColl, and was so saddenned by her death. THe onslaught continues here... turkey and level 50 mages in Diablo 2. What a mix! Heheheh!! Love the cartoon!! Merry Christmas and Happy Holidays to you and your family!! Kirsty MacColl, of course - thanks Teddy! That was a great loss, and I just cannot imagine Kate Moss doing justice to her part in the proposed remake of Fairytale of New York. Glad you liked the cartoon, GOB. 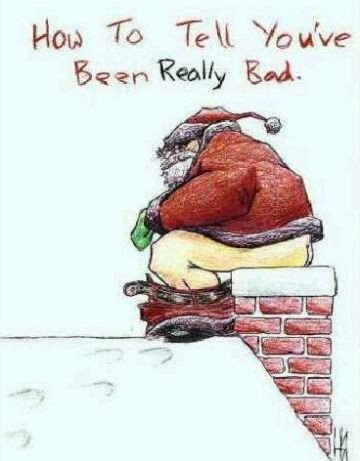 Little did I know at the time that Santa would actually be crapping right on my computer when he sat on my chimney!